Hi, I am Fairy, I am very well known because of the stupid activities that I did before, many people do not like me. The last time I was very tormented conscience, for the fact that I was also responsible for the attacks that occurred in the game a few weeks earlier. 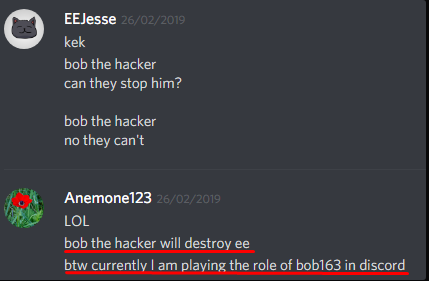 It was I who invented the pseudo-bob the hacker, which was then revealed many times in public. After losing a friend who was very important to me, who finally began to mock my profound apologies and show them to other people, I began to hate this game. I made a lot of problems for other people, Xenonetix banned Thegame, because of me, Xenonetix already wanted to give up and commit suicide, because of me. I set the conditions for Xenonetix, which he had to perform in exchange for my fake information. It was a Big Spender smiley that he had to add to my (already perma-banned account) shy. It shows how disgusting I am, I always need money in return, even in real life, for a small service I ask for a certain amount. All those who used to be considered as my friends turned away from me, I lost everything I gained over the years. Even trying to start all over again, I was constantly revealed by former friends, who tried to disgrace me. 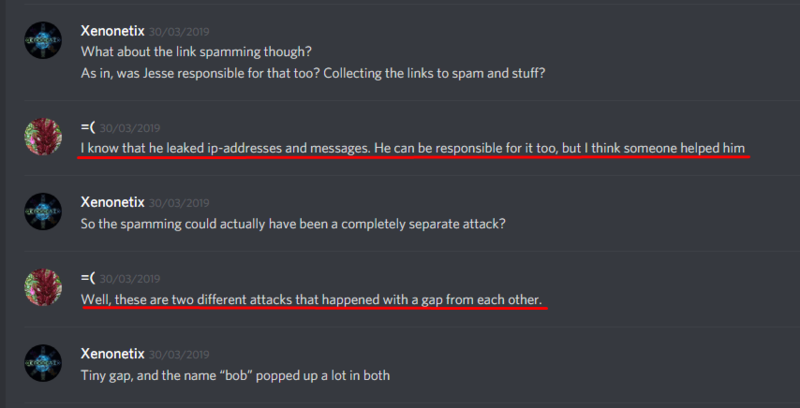 Yesterday I threatened Xenonetix that I would spam in a game, discord server, blog, and forums a tool for hacking campaigns and a tutorial on how to use it if he doesn’t fulfill my desire (which of course was to add some rare smiley to my new account). I am no longer going to participate in the attack, I am going to create a new account with a different IP address and start life from scratch without revealing my real identity. I also wanted to leave this message mainly for my former friends. I lied to you from the very beginning, the name, gender, age that I told you before are not my real ones, even the face (which I also uploaded to the forum, I used photos from not my Facebook account), I do not live in the UK, I lied. Therefore, it is very good that at the end of this whole story I became ridicule who lost literally everything. I will say right away that I did not care about the accounts of a million people, I did not care about the children who followed the links with 18+ content or kill people and all the affected people, I do not care for them. I participate in all this, I enjoyed it a lot, I was very pleased to do all these bad things, especially to help with the creation of the IP addresses list. Now the last thing I want to say. 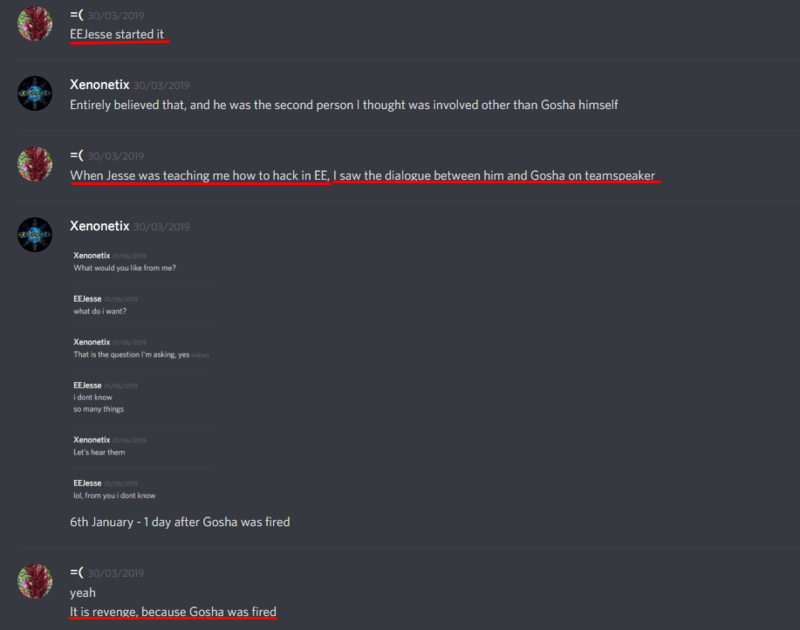 Do not consider Xenonetix a bad owner, because he tried to protect us all, even if he did it badly, we need to appreciate his actions. ▼Pictures of dialogue between me and Xenonetix. Note that everything here is a lie, I tried to hide suspicion in myself and in other hackers who attacked the game. My goal was Jesse, because I had a rigged proof. Well... um, pretty brave to come out about it, but thanks for deciding not to participate anymore, at least? I don't know man, that's **** up. You are a <snip - rude>. <snip - also rude>. Something is wrong with this topic, and I don't know yet what. This is not a path you go on blindly. This just seems to try appear as a reconciliation. Isn't this BasicNet, the person who threatened to buy software to raid the forums and who left some colorful emails about my mother in my inbox? I'm not entirely sure I'm buying that you have any actual bite behind your bark. This is fake, right? This is just a prank you did with Jesse and Xenonetix. The thing I'm curious about is - what made you change your mind so quickly? In the second image you posted, you can notice that that conversation happened yesterday. 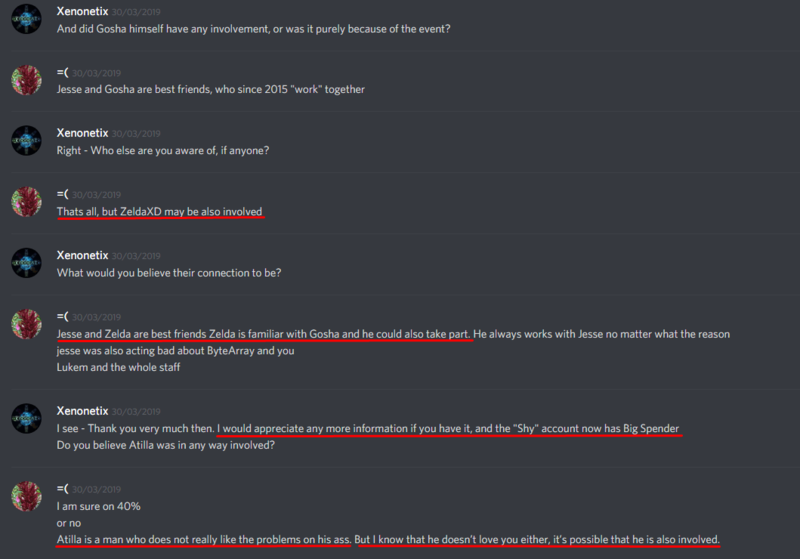 You even changed your discord name to "Xeno **** off" and seemed on hostile terms with him, so why did you make this topic now? You changed your mind about all this after only a day had passed? Just like that? The fact that Xeno wooted this topic almost immediately after you created it is also suspicious. He must have known you were posting this topic. Did something happen just before you made this post, Fairy? And if so, I'd like to know what. Even before creating this post, I admitted to Xenonetix. I was surprised from the start that Xeno wooted this post, I thought he would be hostile to it. because yesterday he threatened me to delete my very first account (which I asked to return) if I do not repeat the game attack. Why did he wooted this post instantly? Because I warned him that I will create a post in which I will explain everything and follow all the screenshots. After I posted the post, I immediately sent him a link. You can call it prank. I tried to ward off suspicions from the hackers themselves and from myself, to make Xenonetix think that I was not guilty. I betrayed my friend Jesse because he was an ideal target, and could easily substitute our conversations and make Xenonetix punish him. I did not quite understand what you were talking about, but I will try to explain. I am at a dead end, I do not know what to do, it seems to me that I am beginning to realize my mistakes. I framed my friend and lost everything I had before. I exchanged friends for a stupid reward. I was tired of all this and decided to confess my guilt. Didn't you say you would make a new account with a new IP address? If that's the case, why do you care about your previous account being deleted? Seems strange to care about something you no longer want. Can you post a screenshot where you told him you'd make a topic? I need to confirm something. As I told Xenonetix, I wanted to regain this account, because it was my first and I had a lot of good memories associated with this account. I can no longer return this account. Because I did not commit attack and Xenonetix deleted my account. I am going to create a new account with a different IP address and start life from scratch without revealing my real identity. I think a better solution would be to permanently distance yourself from EE. I think that your writing style is too distinct for you to have any chance of a fresh start. Further to that, your motives towards the attack show that you take this game way too seriously to the point that it is actively harmful to you as a person. For us and for you, just leave. Uh, why did you scribble your name out? Because I keep my personality secret, I don’t want someone to know my pseudo, which I also use in other games and other sites. I also painted the same name in the picture with my threat to Xenonetix. Can you at least show me the profile picture? Insulting yourself isn’t going to make people forgive you, you know that right? Your whole post is garbage and is meaningless. Don’t come back under another acccount. Oh I see. So it’s not a prank. Actually surprised that you are the attacker. You said you lost an important friend. I lost one too, but I did not care. We get it, you are psycho and want attention. Whatever. So let me get this straight. You turn into a sociopath and cause all this chaos and turmoil over the fact you lost someone as a friend..... Yeah... Just let that sink in for a moment. Losing an important friend is really painful, I have experienced that before. But can it really bring you into madness and decide to hack the game? I don’t think so. I can relate. I definitely became a **** person for a while after a friendship ended with someone I cared deeply about. But expressing that pain to this extent is not the whole picture and blaming that event or using it as an excuse is just not going to fly. I do not care about people's opinions and attitude towards me. I think the fact that you tried to induce sympathy through mentioning your loss of a friend would suggest otherwise.